Life is busy! If you're tired of missing your favorite shows or simply want to save them for watching later on your iPad, try Toast 10 and EyeTV. With EyeTV, you can turn your faithful Mac into a high-definition digital video recorder, saving shows automatically that you can view anywhere: on your computer, on your TV, or on your i-device. Even if you have a DVR, you probably can't export the contents to your Mac, much less your iPhone (with the exception of TiVos, learn how here). 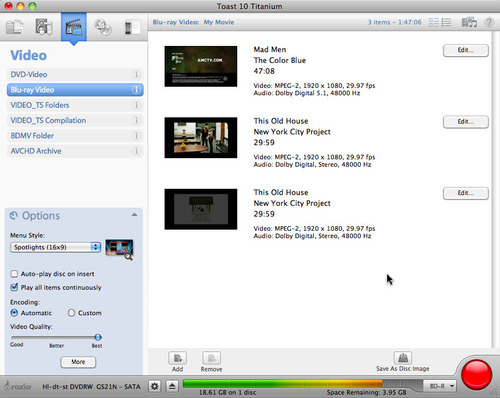 Assuming you already have Toast 10, all you need to do is add one of the several Elgato EyeTV tuner options, such as the EyeTV One and EyeTV HD, to turn your Mac into an HD DVR. Whichever tuner you choose, Toast makes it easy to save the programs you've captured on your Mac to DVD, or export them to your iPad, iPhone, iPod, or other media player. You can also stream them to your Apple TV! The EyeTV tuners do a lot more than just record video to hard disk. 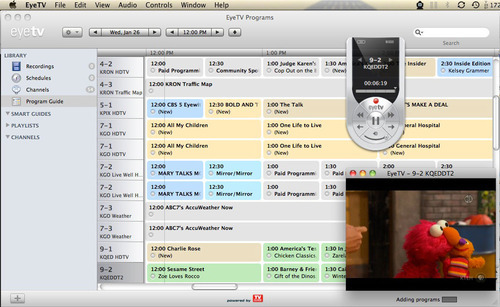 The software interacts with the TV Guide online program guide to schedule recordings, and maintains a list of past recordings stored on your hard disk, so you can use it like you would a regular HD DVR, but without the monthly fees (there is a $20/year fee for the TV Guide service after the first year). It even lets you pause live TV, skip commercials, and enjoy instant replays. 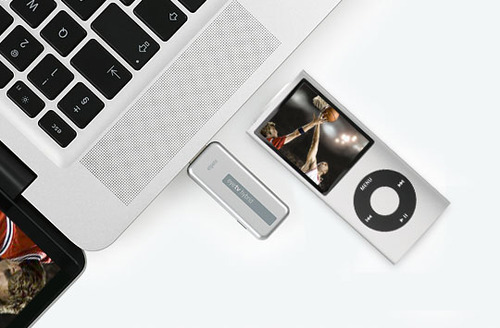 Since most newer Macs, and many older ones, have video output capabilities, you can plug the output from your Mac into a TV set (including HDTVs), and use your Mac's remote control (or your iPhone/iPad/iPod Touch with the Remote app) to watch or record video from the comfort of your couch in full high-definition. Or play back EyeTV recordings through your Apple TV. Open the EyeTV software and three windows appear: a resizable video window, a program guide/scheduling window, and an onscreen controller (which you can use along with or in place of a remote). The onscreen controller tells you what the current show is and how far into it you are, and provides typical fast forward/reverse/pause/record/volume/channel functions, as well as instant replay, mute, program guide, and 30-second commercial skip buttons. The video window can be resized as desired, or fill the screen. You can also show or hide the controller at any time. EyeTV playing Sesame Street live, with controller and program window in the background (click to enlarge). Now that you've become familiar with the features and capabilities of EyeTV, here's a step-by-step guide to burning your recorded EyeTV programs to DVD with Toast, or converting them for your iPad, iPhone or other media player. 1) First, connect things up according to the EyeTV instructions, then run the EyeTV software setup assistant to creat an account for the TV Guide program listing (so you know what you're watching, and can program future recordings). The setup process will also tune all the channels coming off your antenna or cable/satellite input. The program guide supports over-the-air, cable and satellite services. 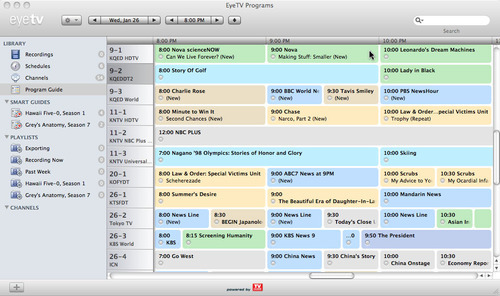 The EyeTV program guide. Clicking the button next to a program name schedules it for recording. 2) Next, choose a future show to record by clicking the little record button that appears next to it. You can even set a show to record all season long, so you'll never miss another episode of "American Idol" or "CSI." Just click the show name, and choose "Record All." Better yet, if you set the preference to "Start EyeTV when a device is plugged in," it will wake up your Mac from sleep to record, and even boot up your machine if it is off (with OS 10.2 or later and automatic login enabled in your Mac System Preferences)! No worries about having to leave your machine on all the time. 3) When you're done recording, the show will appear in the Recordings library, where you can select it for playback on your computer, or send it to Toast for burning or conversion for iPad or iPhone. To make a DVD or Blu-ray Disc (with a Blu-ray recorder and the Toast HD/BD Plug-in) select your EyeTV recording(s) within the Toast 10 Media Browser and drag them to the Video Project window. About 2 hours of standard-definition video will fit on a DVD, or about 2 hours of high-definition video on a 25GB Blu-ray disc. Choose menu and navigation options for your disc at lower left, then press the Burn button. You can also trim out commercials from your recordings before burning, by clicking the Edit button next to each video in the Project window. Making a DVD or Blu-ray Disc from your EyeTV recordings (click to enlarge). 4) To convert EyeTV recordings for your mobile device or set-top player, such as your iPhone, iPod Touch or Apple TV, click the Convert Tab in the Toast window and drag in your recordings from the Media Browser as above. Again, you can trim out commercials or other unwanted portions using the Edit button next to each video. Converting EyeTV recordings for your mobile device or set-top box (click to enlarge). Finally, select the format you want to convert to by clicking the little gear icon at lower left to bring up the Player settings window. We chose to export in iPad and send the results straight to iTunes. Then click the red button to start converting. You can convert multiple shows at once. Using Toast and EyeTV, you can keep your iPad loaded with high-definition shows to watch anywhere, and build up a video library of all your favorite programs. With an over-the-air antenna, you can even ditch cable altogether. Get started saving now!